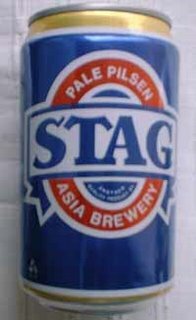 A woman in St. Louis shot and killed her 70 year-old husband after he brought her a warm can of Stag Beer. The beer was warm because the couple had been without power for several days following a winter storm. I'm not sure why they didn't put the beer outside if they were so adamant about "cold" being the correct temperature for consumption. I should probably mention that she shot him 5 times. In the chest. I know you are thinking that is a bit excessive, but that just tells me you have never had to drink a warm Stag Beer.